“Parents keen to make presidential politics ‘relevant’ to their young children will find abundant help in 2008’s extra-large batch of campaign-themed storybooks. But will the tykes care? Children like a bit of fun in their picture books, yet the adult temptation to moralize seems, in most cases, to overwhelm any possibility of an engaging tale. 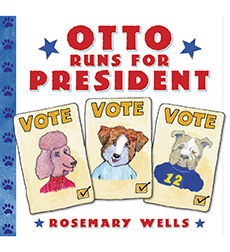 “Consider, for instance, the story of how a virtuous underdog rises to leadership in Rosemary Wells’s Otto Runs for President (Scholastic). Interestingly, the book is dedicated to Elizabeth Edwards, wife of a onetime Democratic underdog whose virtue now seems … somewhat dog-eared. I admire Rosemary Wells greatly, but Gurdon defines her terms so clearly and writes so persuasively that her review left me in no rush to read about Otto. Gurdon was also underwhelmed by Kelly DiPuccio’s Grace for President and Jarrett J. Krosoczka’s Max for President. (Lane Smith’s Madam President not quite as “morally earnest.” ) So which books about electoral politics might children enjoy more? Next Saturday I’ll review one of them, Kate Feiffer and Diane Goode’s President Pennybaker, also included in Gurdon’s roundup online.wsj.com/public/article/SB121944276577664749.html?mod=2_1167_1. “Elected Office: Wasilla City Cncl., 1992–1996; Wasilla Mayor, 1996-2002. Read Katha Pollitt’s “Sarah Palin, Wrong Woman for the Job” at www.thenation.com/blogs/anotherthing/351330 and a review of her essay collection Learning to Drive at www.oneminutebookreviews.wordpress.com/2007/10/16/. 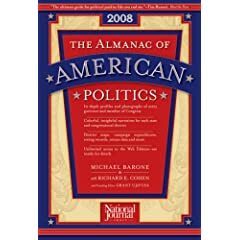 Learn about the Almanac of American Politics 2008 at www.nationaljournal.com/almanac/.